More than 30,000 journeys have been made on PickMeUp, the Oxford Bus Company’s ground-breaking on-demand ride-sharing service since it launched. The landmark was broken today (Weds) in the eastern arch of Oxford. More than 12,000 registered users have signed up to the app and completed the journeys since it the service was launched on June 25th. PickMeUp enables passengers in eastern Oxford to summon buses to pick them up on a street corner of their choice, to go to a bespoke destination. The service is the largest scheme of its kind to be launched by a UK bus company. The service covers the Eastern Arc of Oxford, covering the railway station, Thornhill and Redbridge Park & Ride sites, the Science Park, Oxford Business Park, the John Radcliffe, Churchill and NOC hospitals, University Science Area and Brookes University. It operates between 6.00am and 11.00pm Monday to Friday and between 8.30am and 7.30pm on Saturday and 8.30am to 7 pm on Sundays, with an average response time of 10 to 15 minutes. The introductory fare of £2.50 per journey is still being charged, with a surcharge of £2.50 if the journey could be made via an existing Oxford Bus Company bus route and the walk is 200 metres or less. Multi-journey passes are available as well as corporate packages. 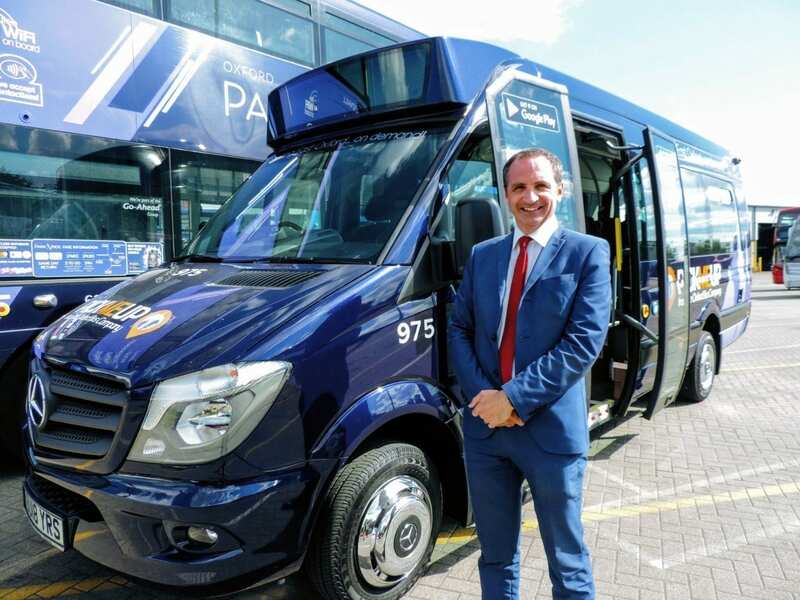 Oxford Bus Company invested £850,000 in six 17-seat ultra-low emission Euro 6 minibuses, with Wi-Fi, USB charging points, wheelchair access and comfortable high-back seating to launch the service. The front-end and back-end technology for the service was developed in partnership with Via, a US-based market leader in ride-sharing technology. The app enables passengers to request a pick up and the mini-bus will go to the nearest safe pick up point. Journeys will be matched with others wishing to make similar journeys to enable ride sharing.